For the few inhabitants of a wedge-shaped piece of land at the very bottom of the world, 2007 marked a very significant milestone. 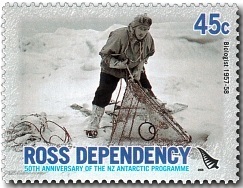 The land is the Ross Dependency, the people are the teams at New Zealand's Scott Base and USAs McMurdo Sound Base, and the milestone is the 50th anniversary of the New Zealand Antarctic Programme, which continues to maintain a unique focus on scientific research in the area. The New Zealand Antarctic Programme is managed by Antarctica New Zealand, the organisation responsible for developing, managing and administering New Zealand’s activities in Antarctica and the Southern Ocean, particularly the Ross Sea. In the 50 years since it was established, the Programme has developed, often in collaboration with scientists from other countries, an extensive research portfolio – investigating everything from meteorology and seismic activity to climate change, biodiversity and Antarctic ecosystems. 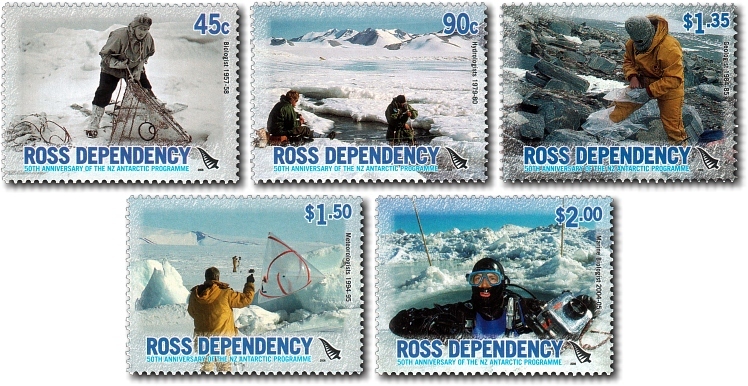 This stamp issue covers a selection of these scientific activities. 45c - Biologist / BioRoss Research Programme. The ‘BioRoss’ research programme aims to improve our understanding of the Ross Sea region. A collaborative project led by New Zealand’s Ministry of Fisheries, it’s developing an inventory of the region’s marine environment and its rich biological resources – especially with the increasing pressures of human activity. The knowledge gained will help to improve the region’s management and support the development of a network of protected marine areas. 90c - Hydrologist / Cape Roberts Project. 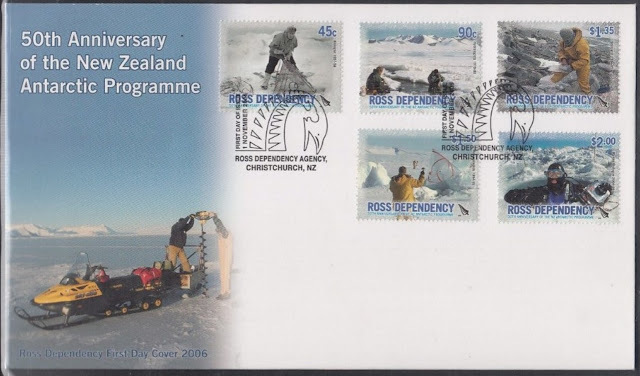 Seven countries around the world joined forces for the 1996-2001 ‘Cape Roberts Project’, which focused on understanding the Ross Sea region’s climatic and tectonic history. As a result of the research, the scientists may have found evidence that the East Antarctic Ice Sheet has expanded and contracted many times in the past – which may help in developing ice sheet models for the future. 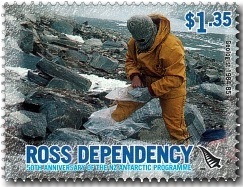 $1.35 - Geologist / Antarctic Drilling Project ANDRILL. 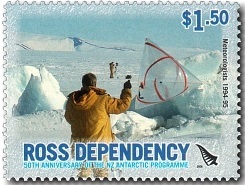 The multinational ‘Antarctic Drilling Project’ (ANDRILL) builds on the results of the Cape Roberts Project. It aims to improve our understanding of Antarctica’s role in ‘Cenozoic’ global change (which means from 65 million years ago until now) – and is doing this through a comprehensive drilling programme in the McMurdo Sound area. ANDRILL involves scientists from New Zealand, the United States, Germany and Italy. $1.50 - Meteorologist / Latitudinal Gradient Project. Scientists from a number of national Antarctic programmes and projects are working towards a common goal through the ‘Latitudinal Gradient Project’. The Project aims to understand the complex ecosystems at five sites along the Victoria Land coast in the Ross Sea region, and to determine the effects of environmental changes on those ecosystems. The information gained will help us to create a picture of the future effects of environmental change. 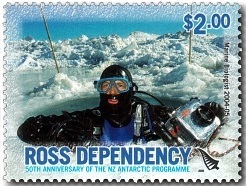 $2.00 - Marine Biologist / Census for Antarctic Marine Life. The five-year ‘Census for Antarctic Marine Life’ aims to focus public attention on the region’s ice-bound oceans during the International Polar Year in 2007/08. The project is studying the evolution of life in Antarctic waters to find out how it has influenced the diversity of the current flora and fauna – and to predict how they might respond to future change. 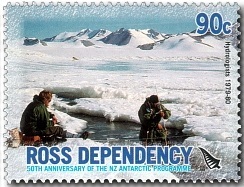 2006 Ross Dependency First Day Cover.